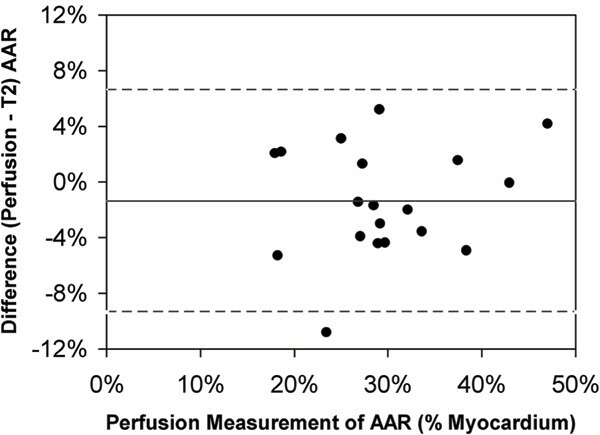 The area at risk (AAR) of infarction is the hypoperfused myocardium during coronary occlusion. T2-weighted CMR delineates the area at risk early after acute injury as well as two days post-infarction. However, this method has not been volumetrically validated in vivo due to complexities arising from surface coil induced 3D variations in signal intensity and low image SNR. To volumetrically validate, in acute myocardial infarction, T2-weighted CMR as a method for visualizing the area at risk, using first pass contrast perfusion during the occlusion as a reference standard. Acute myocardial infarction was induced by occluding the left anterior descending coronary artery distal to the first diagonal branch for 120 minutes in 19 dogs. The area at risk was measured during the occlusion (within one hour from the onset of ischemia) by first-pass contrast perfusion (Gd-DTPA, 0.10 mmol/kg) performed on a Siemens Avanto 1.5 T scanner with a phased-array surface coil. Six hours post-reperfusion, 3–5 stacks of short-axis breath-held T2-weighted (DIR-TSE, TE = 56 or 66 ms) images were obtained covering the left ventricle. For each image position, 3–5 T2-weighted images were registered for motion, averaged and were surface coil intensity corrected. Edematous areas were defined as an area of hyperintense signal activity on the T2-weighted images. Figure 1: Mid-ventricular first pass perfusion image (left) and corresponding T2-weighted averaged image (right). Note the good qualitative agreement between the circumferential extent of the perfusion defect and the T2 abnormality delineated by the red lineThe area at risk as measured by the area of the hyperintense zone on T2-weighted images was comparable to the size of the first pass perfusion defect (30.9% ± 8.1% versus 29.5% ± 7.8% of the left ventricle; p = NS) and the two measures correlated linearly (R = 0.88, y = 0.91 x + 0.04). Figure 2: Bland-Altman analysis of the differences of percent AAR measured by first pass perfusion and T2-weighted images compared to first pass. The mean difference was 1.3 ± 4.0%. In a study of 19 dogs, the area at risk as measured volumetrically by first pass contrast perfusion during coronary artery occlusion can be delineated by the hyperintense area in T2-weighted images post-reperfusion. The area at risk as measured volumetrically by first pass contrast perfusion can be delineated by the hyperintense area in T2-weighted images post-reperfusion. This is a significant finding given the technical problems involved with performing such volumetric validation despite surface coil intensity variations and the subtle signal intensity changes associated with myocardial edema. Volumetric assessment of the area at risk is useful for evaluating infarct reduction and reperfusion therapies in acute myocardial infarction.